(A selection of the contents). 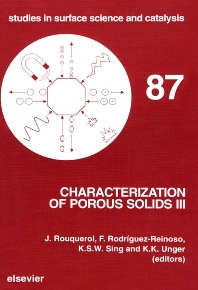 Guidelines for the characterization of porous solids (J. Rouquerol et al.). Simulations of sorption in pores with constrictions (M.J. Bojan, W. Steele). Rare gas probes for energetic heterogeneity in zeolite pores: Theory and simulation (R.J.M. Pellenq, D. Nicholson). Pore-size distribution analysis and networking: Studies of microporous sorbents (C. Lastoskie et al.). Transports in reconstructed porous media (J. Sallès et al.). Modelling of mercury intrusion and extrusion (M. Day et al.). Neutron scattering investigations of adsorption in microporous adsorbents having controlled pore geometry (J.D.F. Ramsay). Electro-gravimetric measurements of binary coadsorption equilibria (R. Staudt et al.). Molecular interactions on porous solids under magnetic field (S. Ozeki et al.). Formation and pore structure of zeolite membranes (D. Uzio et al.). Investigation on adsorption of N2, Ar, CO and CH4 on aluminophosphates (H. Reichert et al.). Sorption kinetic investigation of NaCaA-type zeolite ageing (M. Bülow, P. Struve). A frequency-response study of the diffusion of hydrocarbons in silicates I and II (L.V.C. Rees, D. Shen). Ultramicropore characterization by He adsorption (K. Kaneko et al.). Studies of surface and structural heterogeneities of microporous carbons by high-resolution thermogravimetry (M. Jaroniec et al.). The importance of the porosity of mortars, tiles and bricks in relation to their bonding strengths (M Yates et al.). Author index. Keyword index. 4. Porous materials of technological importance. The wide range of materials and techniques described provide a useful and comprehensive reference source for academic and industrial scientists and technologists. Kenneth Sing is an emeritus professor of Brunel University and visiting professor at Bristol University, both in the UK. He is co-author of the well-known book Adsorption, Surface Area and Porosity.